APEC RO-90 is a 5-stage reverse osmosis system that produces clean drinking water. The system has been in the market for quite some time and is quite reputable due to its impressive specs and results. This is similar to the ROES-50 but has a capacity of 90 gallons per day instead of 50 gallons per day like the ROES-50. Clean water is important to many people. Reverse osmosis is one of the best methods for removing contaminants from water. A list of contaminants can be found on our Types of Water Contamination page. The APEC RO-90 has impressive user reviews on AMAZON and other consumer review sites. Below is a list of APEC RO-90 features, pros and cons and our thoughts on whether it is worth the money. Other RO filters are compared on our Best Reverse Osmosis Filter Systems page. As mentioned above, APEC RO-90 is a reverse osmosis water filter system. It is a five-stage reverse osmosis system that eliminates 99% of contaminants such as arsenic, chlorine, fluoride, lead, copper, and selenium. Removing such contaminants eliminates risks of health related complications, improves taste and removes odor. The APEC RO-90 satisfies all these standards. The system is easy to install and the company provides support throughout the lifetime of the product. APEC RO-90 produces bottled-water-quality water from your tap and in the largest quantities of any of the APEC RO Filters. The contaminant-free water can be used for drinking, cooking, making tea, coffee or ice cubes. The system has a very high rejection rate, making it highly efficient in the elimination of organic and inorganic contaminants. APEC RO-90 has a capacity of 90 gallons per day. Its tank, which measures 11 × 11 × 15 inches, can hold 4 gallons at a time. The tank fills in about 2-3 hours, according to the manual. Any time the tank fills up the system ceases running. The water filtration system runs on water pressure alone, no power supply or fuel is needed. APEC RO-90 can handle water with a pH value between 2 and 11 and temperature between 40 and 100° Fahrenheit. For efficient filtration of water, the feed water should have pressure above 40psi. The system’s dimensions are 16 × 5.25 × 17.5 inches (w × d × h). The dimensions allow installation under the sink. The fittings are high quality, with no extra clipping needed. The fittings are leak free, eliminating any need for leak detectors. Removes 99% of over 40 contaminants. For less than $300, the APEC RO-90 delivers what the company promises. 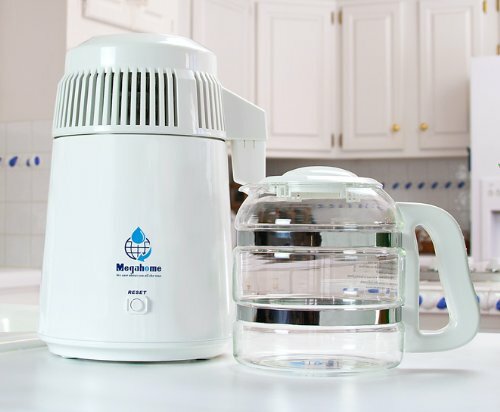 You will get quality and clean drinking water with this low maintenance water filter. We highly recommend this product. It doesn’t matter where you live or how nice your home is, almost everyone has some degree of hard water. The good news is that hard water doesn’t typically cause any serious health hazards. The next question will be what is the best water softener? and this page is here to help you make that choice. What’s So Great About Soft Water? Hard water can be a complete nuisance. Think of all the ways you use water around your home. You may have noticed some effects of hard water but didn’t know why or what was causing it. Here is a short list of some ways hard water can affect your life. It can make your laundry look dull and stiff after cleaning, or worse, it can leave yellow or gray streaks on your clothing. Showering in hard water can leave your hair dull and flat and your skin dry and flaky. Hard water also makes soap less effective. Whether it is laundry detergent, shampoo or hand soap you will end up using more of it and not getting the full benefits. Talk about a waste of money! Dishes washed in hard water can leave a scum. If your drinking glasses are cloudy, you probably have hard water. Luckily, there are ways to soften your water and stop the drain on your finances. Since hard water is such a common problem, there are many products on the market aimed at fixing it. The difficulty is determining which product will work best for your home. I’ve combed through many water softener reviews and picked the best water softeners to help you narrow down the choices. ​City water goes through a water purification process before it gets to you. However, the amount of calcium and magnesium in the water (hardness) can cause the problems discussed above. Also, many people use well water that is considered hard. For a more detailed description of water softening visit our “How Does A Water Softener Work?” page, read the Scientific American article, or watch a video on the How Stuff Works website. If you want the convenience of having one unit that prevents hard water in your entire home you should consider a whole house water softener. A whole house water softener helps reduce and prevent scale build up in all your faucets. You get the benefit of cleaner showers and money saved on soaps and detergent!A whole house water softener also protects your pipes from the corrosion that builds up over time from the hard water minerals – saving you money on plumbing and repairs.There are two types of water softeners that you can buy for your home. One uses salt to replace the minerals in the hard water using ion exchange. Although these are great for softening your water, they are a bit of work because they typically use electricity and the salt has to be replaced periodically. Instead of salt, these water softeners neutralize the minerals that make the water hard and turns them into crystals so that they cannot attach to the inside surface of the pipe. Some may find these less effective, but others prefer them because they don’t leave a slippery feeling on your skin. The Fleck 5600SXT is widely known as one of the top water softeners on the market. This unit uses salt to replace the minerals that cause hard water and is perfect for households of 3-6 people with moderate to very hard water. The installation process takes about 2 hours and for most will not need a professional plumber. However, you will be inserting it into your water line so it does require some plumbing experience. At 147 lbs, it is quite heavy and you may need help during installation. The Fleck 5600SXT uses a special meter based regeneration process so that it measures the water it uses and it only replaces the water when necessary, making it very efficient. This unit has a digital display that is easy to program and comes in two colors, almond or black. Although this unit comes with a higher price tag, it has the best water softener reviews and it also comes with a 10 year warranty on the tank and a 5 year warranty on the electronics, so it is built to last. The Aquios AQFS-220 is one of the best salt-free water softeners available. Unlike the models that use salt, this unit uses no electricity and is low maintenance. Also, because it crystallizes the minerals instead of replacing them with salt, you don’t lose the benefits of having calcium and magnesium in your drinking water – you only get rid of the side effects of hard water scale. However, since it is a conditioner instead of a softener, you probably won’t see a decrease in soap usage or get the “slick” feeling from soap. In addition to softening your water, the Aquios FS-220 also filters out contaminants like chlorine and dirt. This unit is good for the entire house and it won’t cause a loss in water pressure. The filters are good for 40,000 gallons meaning that the only maintenance you will have is to change the filter once every 6 months. Also, the housing and valve come with an amazing 20-year warranty. The unit itself is easy to install, but if you prefer to hire a plumber for installation it will take them less than an hour. If you are looking for a great portable unit to use in your RV, this is the unit for you. Campsites are known for having either very hard water or well water, which can be awful for the pipes in your RV. With this unit, you won’t have to compromise your health or spend your entire vacation cleaning the showers and sinks of limescale. It also comes with test strips so you can see with your own eyes that the system is effective. However, with the benefits of having a portable unit, there are also some downsides. This unit must be manually regenerated, so there is more maintenance than a whole house unit. It would be impossible to take a bulky whole house unit on the road, so for most the trade off is worth it. As long as you regenerate it on a regular basis, this is the best unit for the money. If you are looking for a salt free water conditioner solution to your hard water problems, you should consider the Aquasana EQ-1000. Although this unit is higher in price than some of the others, it is meant as a long-term solution to your hard water problems. It is low maintenance and only requires replacement of the main filtration tank every 10 years or 1,000,000 gallons. The Aquasana EQ-1000 has 3 filtration systems to remove the greatest amount of contaminants possible. The filters on this unit remove 97% of chlorine and other microscopic impurities. Depending on your needs and the types of contaminants in your water, there are many different options to add on to this unit, including a UV filter. The water softener itself is salt-free (a conditioner) and therefore doesn’t remove the minerals, but prevents scale buildup. Additionally, the Aquasana EQ-1000 does not use electricity or waste water from back drainage. One of the downsides of this unit is that unless you are a skilled DIY person, you will likely need a professional plumber to install it. Also, reviews indicate the plastic connectors are prone to failure. Additionally, since it is a conditioner instead of a softener, you probably won’t see a decrease in soap usage or get the “slick” feeling from soap. One of the best lower cost models is the Eddy Electronic Water Descaler. This unit is a straightforward water descaler and it does its job well. It is also one of the most lightweight units at 1.4 lbs. The Eddy Electronic Water Descaler does not use salt to soften the water. Instead it uses electro-magnetic waves which alter the property of the limescale so that it can no longer stick to hard surfaces like your shower walls and doors. This means you get to keep the essential minerals like calcium and magnesium in your water, without the time consuming task of cleaning limescale deposits. The company is so confident that you will like their product that they offer a 12 month money-back guarantee. One thing to keep in mind if you are considering this unit is that although it works on almost any type of PVC water pipe, it does not work with lead and iron pipes. Not a water softener but a whole house filter – an alternative. Reverse Osmosis water systems are much more expensive ($3K and up) for full house water softening. Reverse Osmosis filters so many contaminants out that they typically drop the water pressure and waste a lot of water. A much better alternative is to use a water softener for your entire home and then add a Reverse Osmosis filter for just the areas that need purified drinking water. If you have hard water and extra contaminants in your water supply, your water problems will be magnified. If this is the case, then you may want to consider adding a reverse osmosis water system after the water softener. The reverse osmosis (or RO) system will remove other contaminants from your drinking water. Reverse osmosis water systems not only prevent scale build up, but they also reduce the amount of contaminants in your water supply – sometimes by as much as 99%. This option is incredibly important if someone in your household is allergic to chlorine and it can make a world of a difference. Reverse osmosis water systems are also great if you have well water as their filters can improve the taste and smell of your water. The only downside to reverse osmosis water systems is that they can be incredibly inefficient. Because the water goes through the filter and the contamination goes back down the drain, reverse osmosis water systems can discard up to 85% of the water coming from your pipes. Considering how much water is wasted with an RO system, the whole house RO is not recommended. Whole house RO is particularly not recommended for well water systems. Smaller Reverse Osmosis systems are usually just installed underneath the kitchen sink so that the water can easily be used from drinking and cooking. These small RO system won’t help with hard water in the shower which is what most people are looking for. For more information on RO systems, take look at our How Does Reverse Osmosis Work page. For help selecting an RO system, take a look at our Best Reverse Osmosis Systems page. When investing in a water softener for your home there are many things you need to consider. There are a wide range of models out there and an even wider range in cost. If you are looking for a whole home unit, you may want to consider investing in a more expensive water softener. These are typically more permanent and they need less maintenance. The salt based water softeners need salt to regenerate the softener. Sacks of salt pellets can typically be purchased at home & garden stores. One popular manufacturer of salt pellets is Morton Salt Company. I’ve had great luck with the System Saver Salt Pellets. If you just want a basic model there are plenty of good options that cost less than the whole house units and still do a great job at softening your water. Are you looking for a unit that will soften or filter the water in your entire home or do you just need a localized unit? If you don’t necessarily need to soften the water in your entire home, you may want to consider a shower head unit. This will save on shower cleaning and prevent the dryness in your skin and hair caused by hard water. If you are looking for a unit to take on the road in your RV there are options for that as well. We suggest the Watts RV Pro-1000 above. The disadvantage is that it will need to be recharged manually. Another thing to consider is the environmental effect of each unit. The salt used to recharge the salt based water softeners will be hard on your septic. Many people prefer to drain this into a pond but the salt will kill the plant growth around it. Most water softeners do not waste a lot of water, but if you are looking at a reverse osmosis water softener this will be a consideration. Reverse osmosis units tend to waste a lot of water, but they are effective at softening and filtering hard and contaminated water so you will have to weigh the costs and benefits. Salt based water softeners tend to be better at softening the water, but there can be a lot of maintenance involved because the salt needs to be replaced periodically. Salt-free units may not always be as affective as their salt based counterparts, but they are definitely less involved on your part. Do you live in an apartment in which you don’t have the ability to change the entire water supply? Do you like the calcium and magnesium in your drinking water and just don’t like the effects it has on your hair and skin? In either of these cases, a shower head water softener may be the best choice for you. Most shower head water softeners also come with a filter to protect you from the hard water scale and the other contaminants that may be coming out of your pipes. When deciding on a shower head water softener you can choose to get a filter that attaches to your existing shower head or you can get an all in one unit that includes a filter in the shower head. The former may be the best choice for you if you have a shower head that you love, but you just don’t want the negative effects of hard water. The later is more convenient if you just want one unit and you don’t want to deal with having many parts. There are many things to consider when choosing a water softener for your home. Depending on the extent of the contamination you may want to consider going a step further and getting one that also has a great water filter. Whether you need to soften the water in your entire home or just your shower or sink, there are plenty of options out there. A water softener can be a great investment. Despite the up front cost of the unit, it will save you time and money and keep your pipes clean of the scale build up that can cause corrosion. Have you seen the terms “soft water” and “hard water” and wondered what they mean? Why do we need to soften the water used in our homes? To understand the concept of water softening and its advantages, we must first learn about the types of water. Depending upon the amount of dissolved minerals in our water, we have two types of water: hard water and soft water. Water picks up minerals such as magnesium and calcium when it passes through the soil and rock underground. The amount of minerals in the water determines the hardness of water. If there is a high concentration of minerals in a gallon of water, it will be called hard water compared to a gallon of water with only a few minerals. Hard water is not harmful but it is undesirable because it can clog pipes and reduce water flow. Washing laundry with hard water doesn’t completely clean the clothes and can damage clothes in the long run. It is preferable that household water doesn’t contain these minerals. The process of removing these minerals is known as softening of water. The hardness of the water is due to minerals like calcium and magnesium saturating the water. The act of softening of water is removing these minerals. Water softeners work on the principle of ion exchange where the harmful minerals are replaced with another mineral. In the case of salt based water softeners, these minerals are replaced with sodium. A water softener is a mechanical device that is attached to the household water supply system where the water enters the home. After exiting the water softener, the soft water is then sent to the different water faucets in the home. A water softener consists of a softener tank which has thousands of tiny resin beads or zeolites, which are basically polystyrene beads. The resins are coated with sodium positive ions. The resin beads attract and bind the magnesium and calcium ions present in hard water. Calcium and magnesium have a positive charge and they switch positions with the sodium ions on the resin bead as water is pumped through the beads. Water coming into the softener has calcium and magnesium minerals. Water exiting the water softener will have sodium ions..
After some time, the beads are saturated with calcium and magnesium and the water exiting the water softener is hard again. To remove the calcium and magnesium from the resin beads, a regeneration cycle is required. A strong saltwater (brine) solution (created using common salt in a separate brine tank) is used to wash away the minerals collected by the beads. Calcium and magnesium ions are displaced by the high concentration of sodium ions in brine solution, and the resin gets coated with new sodium ions. The salty rinse water, and the minerals are flushed down the drain and a cycle has been completed. This is known as recharging of the resin, and the process is repeated every few days. The process of recharging can be controlled in a variety of ways. The most common method is the use of electric timers which automatically flush away the rinse water and minerals through the drain on a fixed scheduled time. The second method is to use an electronic device or mechanical meter to measure the amount of water usage. The device starts the regeneration process once the set amount of water has passed through the mineral tank. There are some arguments against salt-based water softeners. The main argument is that minerals like magnesium and calcium are healthy and beneficial to us and they are being replaced by sodium. Sodium can be harmful to both our health as well as the environment. Also, the cost of maintenance can be high, and the cost of buying salt must be factored into your budget. Is A Salt-Less Water Softener Good? Water softeners have been developed that don’t use salt at all. These are the salt-less water softeners. Technically they don’t soften the water because the hard minerals aren’t removed from the water. Instead they are crystallized so they don’t adhere to the surface of clothes or utensils. The term “water conditioners” or “descalers” is used to describe these devices instead of water softeners. They use either magnets to “condition” the water. Usually permanent magnets are fixed to either the inside or outside of water pipe. The magnetic field from the magnets crystallizes the minerals. Another alternative is using an electromagnet – an electrical current carrying wire – around the water pipe which performs the same function as the magnets. But Is a Salt-Less Water Softener Effective? Although salt-less water softeners are cheaper and easier to maintain than salt type water softeners, studies suggest they aren’t as effective. Many people argue that the laundry is not as soft and the whites aren’t as white when salt-free water softeners are used. The use of salt-less water softeners is limited. Salt based water softeners are much more popular than salt-less water softeners. In many areas, water softeners are a necessity because of the issues caused by hard water if not treated properly. We have discussed “how do water softeners work” with an overview of removing the problematic minerals magnesium and calcium that build up over time. This “scale” is what you’re trying to prevent. These minerals don’t form lather easily and mess up the cleaning process. More importantly, they cause buildup of scale in water pipes which if not treated at the earliest would become a huge issue in the long run. The replacement of pipes would result in huge costs and inconvenience. It is important to invest in good water softening equipment and there are two main options available. One uses salt such as sodium in the recharging cycle of resin beads. The second is a salt-free water conditioner that is popular due to concerns related to sodium intake and is a cheaper alternative. It uses either magnetic or electric fields to neutralize the minerals. It also has a much simpler set-up and is less costly (no monthly salt purchases). As is the case to every technology, there are pro and cons to every alternative. Water softeners with salt are preferred because of their reliability and efficiency. Ultimately it comes down to the preference of each individual but this article has given an overview of the different types of water softeners. For a more detailed look at water softener options, look at our best water softeners reviews page.